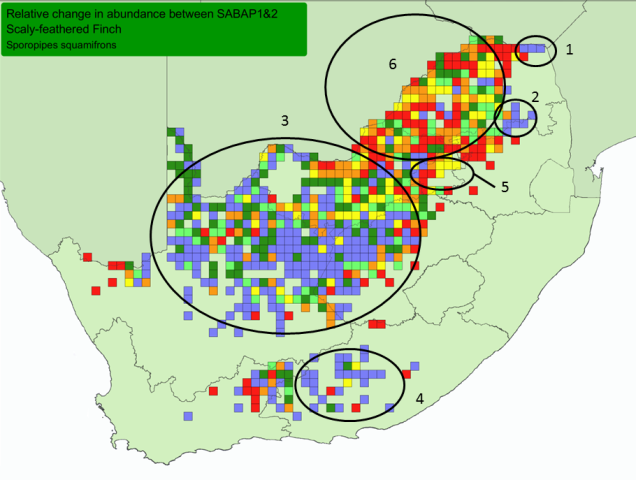 Scaly-feathered Finch, Range-change map between SABAP1 (1987-1991) and SABAP2 (2007-current). In South Africa the Scaly-feathered Finch has more grid cells with increases in reporting rate than cells showing decreases, between SABAP1 (1987-1991) and SABAP2 (2007-), although this is reversed when using 30 checklists for the analysis. The points below match the points on the map above. 6. Large or very large decreases appear to have occurred over large areas of northern South Africa, probably related to habitat changes. Angola: range extends further than mapped in (Fry 2004a) (in prep.). Zimbabwe: range increasing around Bulawayo (Dean 1963a).